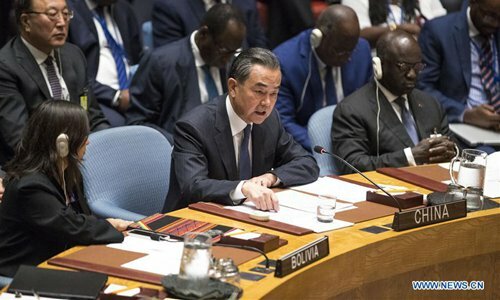 China proposed to the UN Security Council on Thursday that North Korea be rewarded for steps it has taken toward denuclearization, while the US continues to demand that sanctions against the country be enforced "without fail." "Reversible provisions" to the UN Security Council resolutions would help keep pace with developments on the Korean Peninsula, which includes North Korea's pledge to end its nuclear and missile program, Chinese experts said. The UN resolutions do not have a mechanism that would allow the easing of sanctions step by step. At the meeting, US Secretary of State Mike Pompeo warned "members of the UN Security Council" that they must "set the example" by enforcing sanctions on North Korea, Reuters reported on Thursday. Until Pyongyang gives up its nuclear weapons program, Pompeo said, "Enforcement of Security Council sanctions must continue vigorously and without fail until we realize the full, final, verified denuclearization." Wang also stressed that the Security Council's resolutions related to the North Korea must continue to be implemented fully, completely and accurately, according to Xinhua. "The fact is North Korea has already suspended its nuclear and missile tests, and the existing UN Security Council resolutions don't say what the members should and could do in this situation," Wang Junsheng told the Global Times on Friday. "When UN Security Council members use sanctions to prevent North Korea from launching nuclear and missile tests, they should also show North Korea a clear way out for denuclearization, and this is why 'reversible provisions' suggested by China are important and reasonable," he said. "The core issue for the second Kim-Trump meeting will be the sanctions. If the meeting is to achieve a breakthrough, the US will loosen the sanctions and North Korea will take more concrete steps on denuclearization. Otherwise, it is impossible for North Korea to realize CVID [complete, verifiable, irreversible denuclearization] if the US insists on maintaining its current stance," Cheng Xiaohe, an associate professor at the Renmin University of China's School of International Studies, told the Global Times.